Fastener screw on tee nuts provide internally threaded barrels which accept screws or bolts to attach items to a surface when inserted into the back end. Due to their pronged design style, T nuts are often used in wood, composite or particle board furniture applications. Screw on tee nuts are constructed of either steel or stainless steel and are available as either standard or metric tee nuts. Contact us for more information regarding the standard and metric tee nut options that JHP can provide for your project needs. Screw on tee nuts are very simple to install. A drill bit is initially used to drill a hole that is a little wider than the barrel of the tee nut that is used. The T nut is then pushed or lightly tapped with a hammer until it is joined by the bolt on the opposite side of the material for joining. Once the bolt is tightened, the tee nut will be pulled flush into the surface of the material. 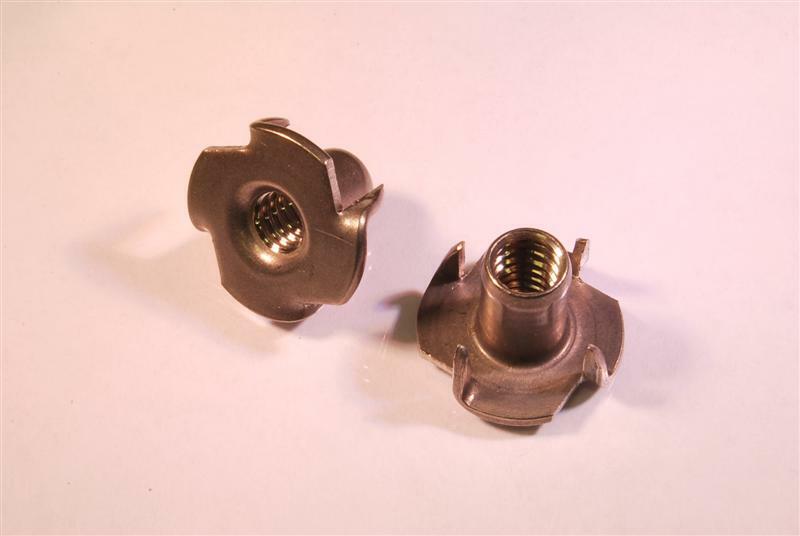 Contact usfor the highest quality standard and metric tee nuts in the industry, or call us at 800-783-0910 with any questions you may have.